It is important to respect the work trail groomers do to smooth and restore the snowmobile trails you ride on to a safe condition. Recognize that groomers may be working on the trail at any time. Always keep your snowmobile under control and anticipate that a groomer could be around the next corner or over the hill—and they are a large, immovable object that will win should you collide. Snowmobiles are much smaller and much more maneuverable than groomers, so always yield to trail grooming equipment. 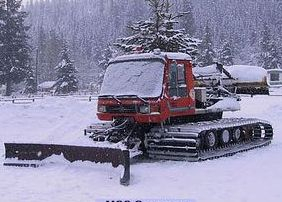 Always slow down when approaching or overtaking grooming equipment. Understand that groomers move very slowly—typically only 5 to 8 miles per hour—so they are almost stationary when compared to a snowmobile traveling 30 to 60 miles per hour. When approaching an oncoming groomer on the trail, slow down and move your snowmobile to the far right side of the trail. Realize that the grooming drag or tiller behind the grooming tractor is very wide, may extend wider than the tracks of the tractor, and may take up most or all of the trail's width. If the trail is narrow or winding, you may need to stop at the far outside edge of the trail, or even off it, to allow the groomer to pass. When overtaking a groomer from the rear, slow down and assess the situation ahead. If there is good sight distance and the trail ahead is clear of oncoming traffic, pass the groomer while operating with caution. Beware that the groomer may create snow dust and make visibility poor as you pass it. If the trail is narrow or winding, you may need to stay behind the groomer until the operator pulls over and signals for you to pass. Be patient since it may take quite a bit of time before there is a good location with sufficient room for you to safely pass. If you need to stop a groomer to ask the operator for information or assistance, understand this should be done only in an area where there is good sight distance and is safe for it to stop. The groomer operator may instruct you to follow the groomer to a safer location where he can safely stop to provide the assistance you need. Snowmobile trail grooming requires a 'set up' time whereby the freshly groomed trail can re-freeze. Therefore riders must understand that riding on freshly groomed trails during this essential set up time can quickly destroy the trail base, resulting in long-term rough trails. Set up time will vary depending upon temperature and moisture content of the snow. Generally, at least two to six or even more than ten hours may be needed for the freshly groomed trail to set up to where it is durable and can withstand heavy snowmobile traffic. Respect the work trail groomer operators do by never following directly behind their grooming equipment, since it immediately destroys their work. If possible, try to avoid riding a snowmobile on freshly groomed trails for at least two hours after the groomer passes by either waiting or choosing an alternate route. Showing this respect can help improve the quality and durability, as well as the safety, of your snowmobile trails. Understand that aggressive riding styles harmfully impact the quality and smoothness of the snowmobile trails you ride on—whether the trail is freshly groomed or not. Powerful engines, carbide runners, aggressive tracks, traction devices, fast starts and stops, and powering through curves all combine to destroy the smoothness of any snowmobile trail. So the next time you hit the brake or throttle, think about how you may have innocently (or purposely) contributed to destroying the trails you would really prefer to be smooth.